Looking NE from NW corner of house across path between front door, toilet to left and front garden gate to the right. Sunday’s dig succeeded in finishing the excavation of the grid square over the path towards the front door, down to its former ground surface. No new features but plenty of finds. Cast iron gutter on brick paved path to front door. Collapsed cast iron guttering on path to front door. The images above show parts of a length of collapsed cast iron guttering sitting upside down directly on the paved path surface. 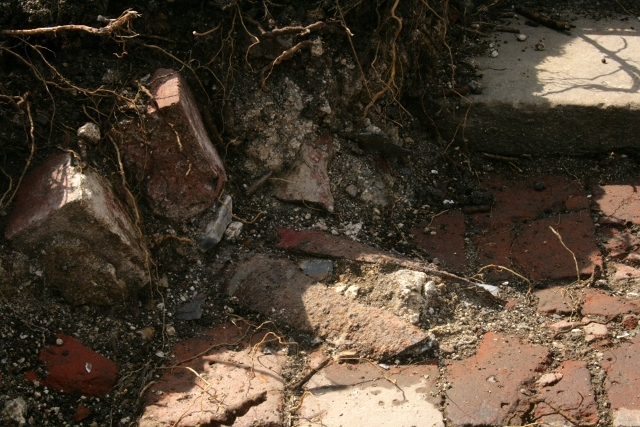 It was upside down and had shattered in situ, and so – based on the assumption that the paved path was kept clear of domestic occupation debris – it had almost certainly preserved, underneath it, a snap shot of the early stages of the demolition of the house; a relatively large quantity of broken window glass – of the thicker type – and some roof tile, all embedded in a heavily compacted layer of highly fragmented mortar. This indicates the path had been in active use shortly before the house was hit by artillery shells. Also clearly to be seen in the photos are areas of red lead paint which was most commonly used as a preservative for woodwork, but any such wood – to which the guttering may have been attached – has long since rotted away. Only a few rusty nails remain. 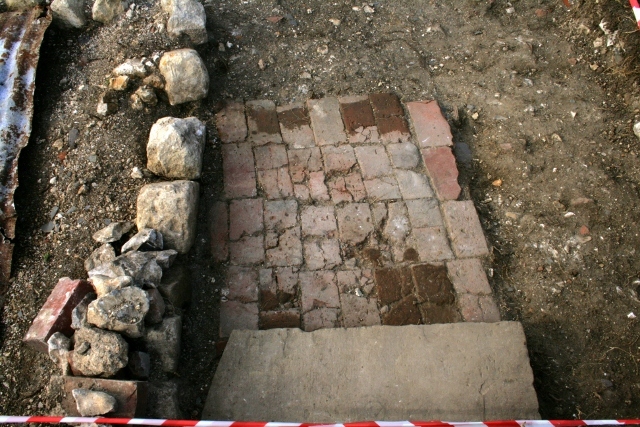 Photo of brick paved path taken from path junction; facing direction of front door (top), with toilet off to the right and front garden gate off to the left. 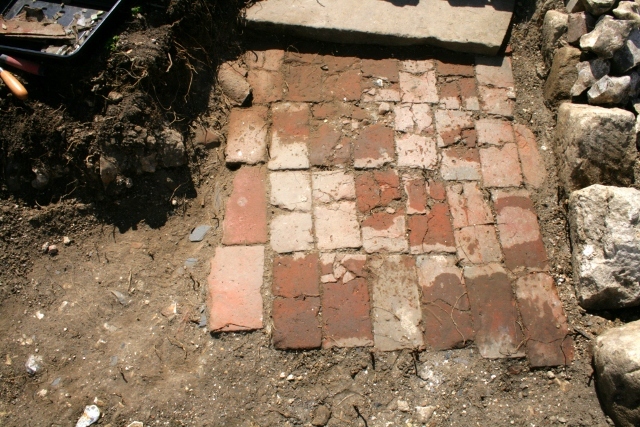 The above photo clearly shows the cleaned up brick path. 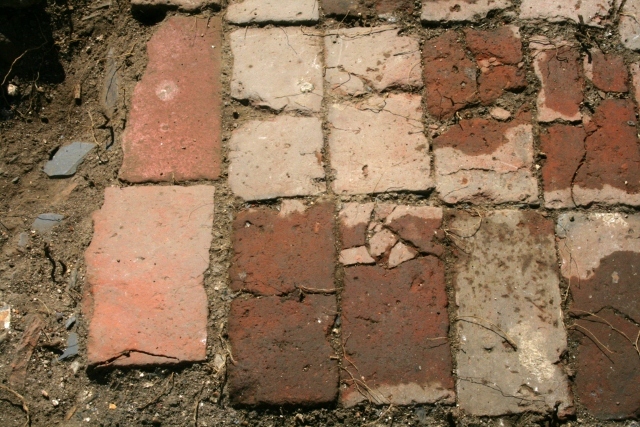 Its north-east corner (bottom left) showed wear consistent with the possibility that both its northern (bottom) and eastern (left-hand) edges are original. Looking S at two floor tiles used on NE corner of paved path. This is further supported by the observation that two broken floor tiles (thick, heavy and hard-wearing) were used for the outer edge of this paved area. Looking SE from corner of toilet at stone edged, brick and earth paths ( yard?). View N from front door across paved path, with possible earth floored yard to its right, toilet top left and garden top right. The earthen ground surface to the east of the paved path surface, and to the south of the path’s eastward turn (on its way towards the garden gate), was more compact and stony than that of the garden surfaces on the other sides of the path. It was similar to the earth surface of the path itself – suggesting it was part of a yard – perhaps one in which the well (which Peggy’s older brother and sisters’ remember) was located. 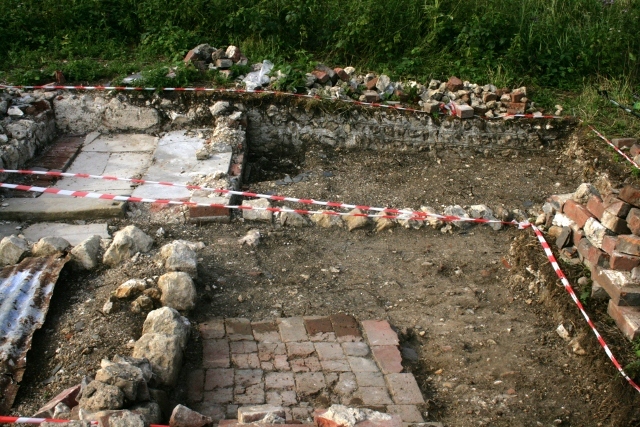 The above photo shows that whilst the step heads slightly towards the right, the brick path turns, just slightly, to the left – towards one of the most important buildings on site, the toilet! The ‘fill’ on top of the original ground surface was split into three parts: the topsoil; the upper part of the demolition fill; and the lower part of the demolition fill, including the ground surface on which it sat. 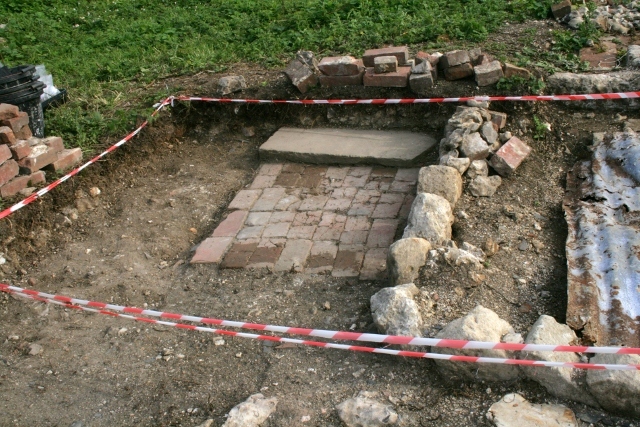 The artificial division between the two parts of the demolition fill roughly coincided with that of the tops of the highest features in this grid square – that of the stone blocks which separated the garden from the path. Horizontally, each side of the edging stones is a different context – the west side having been previously excavated. Rightly or wrongly, the lower part of the demolition fill over the possible yard surface to the east of the path was not separated into a different context. 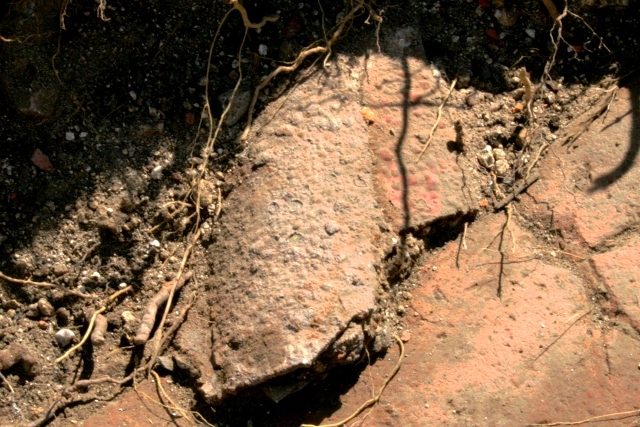 From these contexts a range of finds were unearthed. The topsoil was very dark with tiny flecks of mortar, and only one small shard of the relatively modern window glass was found in it. 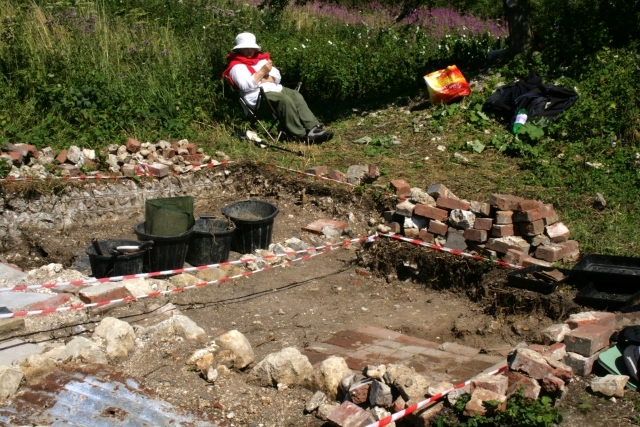 The upper part of the demolition fill contained a relatively wide range of finds, but were much fewer in quantity than that of the lower part. The ground surface itself contained the highest proportion of domestic bottle glass and ceramic shards. It was from this latter layer, that we found our first entire bottle – definitely the best find of the day and one of the best of the whole dig! It was about the size of a whisky miniature, though unmarked by any obvious decoration or lettering. Some nice ceramic shards were also found – including a relatively large number of unusual looking pieces which had matte green coloured inner and outer surfaces and which had rounded, right-angled, surface sculptings, and similarly sculpted corners. It was far from clear what it was – perhaps a square or rectangular green painted plaster container. A large proportion of the plentiful glass shards were of a relatively modern looking window glass. The gable front of the house had three windows which overlooked the front of the site – the 19th century washhouse or scullery, and two upstairs bedrooms. Quite a few rusty nails of a variety of shapes and sizes, a long fragmented length of cast iron guttering, some other rusty finds of unknown origin, and a single WW2 .303 rifle cartridge made up the metal finds. Part of a bone (chicken? ), a button, a strange flat about 3cm sized fragment of a rubber like substance, black on one side and reddish on the other, and a couple of fragments of coal made up the miscellaneous finds. There may have been one or two other finds gathered up in our finds bags, but these are the ones I can recall.